1. 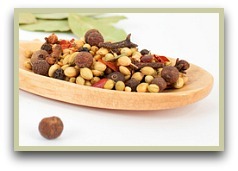 Spice Mix Of The Month "Mixed Pickling Spice Recipe"
“Don't eat anything your great-grandmother wouldn't recognize as food." ~Michael Pollan. This home made pickling spice mix is quick and easy-to-make and is ideal if pickling fruit and vegetables is a hobby of yours. Crumble the bay leaves, break up the cinnamon stick and chop the dried ginger into smaller pieces. Add all the spices to a muslin bag or a square of cheesecloth tied at the corners to make a parcel ready for your pickling. To use your spices, there is a recipe for pickled red cabbage here. If you're into Facebook visit my new Facebook page where you get updates of new recipes and other tips and info to do with herbs and spices. This is my new recipe book for making herb and spice tea.